There has been a blizzard of media articles on ‘Rapid’ prefab housing and serious questions are being asked about delays and costs. In the last week Dublin City Council cancelled and re-issued tenders for the next tranche of 131 homes citing a “lack of interest” and “technical issues”. The first tranche, promised for 18th December 2015, are still not ready for occupation, nine weeks after the end of the 4 week contract. Fast-track projects need careful management and BCAR compliance issues may well be one of the contributing factors in the recent delays and ‘technical problems’ during the tender process for these much needed homes. Normally in timber-frame projects the owners arrange foundations, siteworks and drainage before the timber-frame (or prefab home) is delivered and installed under a separate contract. This makes sense, cuts costs and avoids delays. However, under BCAR the procurement of prefabs may now become a lot more expensive, as one builder must be employed from start to finish on a project under the 2014 procedures. As a result a builder has to engage the prefab supplier as a sub-contractor, which generally adds 5% to the cost of the prefab element. It is reported that each unit of the first tranche in Poppintree, Ballymun is costing €190,000 (see Link). However, this may be even higher when additional costs of up to €60,000 per unit are added for siteworks and vat. These figures do not include the cost of purchase of the site, which in the case of the Tranche 2 Drimnagh site is €120,000 for each house. With overall costs for a typical 3 bed prefab of up to €350,000 each (including vat), this form of ‘prefabrication’ is fast becoming unattractive and less competitive when compared to conventional “wet trades” and traditional forms of building. 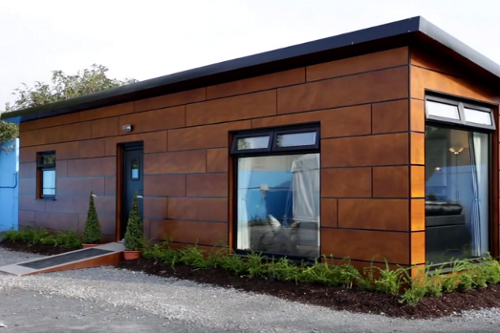 Some industry insiders believe that the Dublin City Council “prefabs” are not modular construction, as recent media photographs show standard timber frame with brick finish, similar to thousands of units built during the boom. Boom-time houses were generally ‘self-certified’ under the old system that operated before March 2014. However it is still unclear who will be certifying these new prefab homes- will it be the Local Authorities that commission them or the builders themselves?. Under the BCAR ‘ reinforced self-certification’ regulations, final sign-off by the builder/ supplier or his own employees or the employees of his sub-contractors is permitted without any independent oversight of compliance. Ultimately, the legal responsibility to make sure that inspections are completed is with the owner, in this case the Local Authority. However, it may well be that the Council subcontracts out these duties to a Design Certifier and an Assigned Certifier within the Modular Homes supplier company. With regard to the tender the contractor takes on the responsibility for design supervisor for both the design and construction stages as the project would be a design and build project. All aspects of the design are therefore the contractors responsibility. The contractor must therefore ensure that the building which is produced is constructed in line with the building regulations. DCC would also appoint an Assigned Certifier to review design proposals put forward by the contractor and to also review works in progress to ensure that the development is constructed in line with the building regulations. The Assigned Certifier is also responsible for signing off the building upon completion to determine if same is constructed in line with the building regulations. Therefore the completed building is certified by the Assigned Certifier on behalf of DCC. If Local Authorities are to appoint employees of prefabrication companies in the roles of Assigned and Design certifier, the contractor will be in full control of compliance: complete contractor-controlled ‘self certification”. Given some of the problems with timber frame housing and contractor-led construction in the past serious questions must be asked about ensuring safety in these ‘Rapid’ builds. Bregs Blog “Is Building Control a threat to Christmas completion of modular homes? This entry was posted in Building Regulations on March 8, 2016 by BRegs Admin. Perhaps one outcome we can hope will occur of the inevitable push for Local Authorities to build more social housing is that they will put pressure on to change the Building Regulations regime. Since they are now included in BC(A)R they will undoubtedly find at first hand how cumbersome, onerous and expensive the process is. When they are asked to account for delays and increased costs of providing social housing let’s hope Building Regulations come top of the list of factors. It would be great if this caused a complete rethink – but I suppose that’s only a dream. The cynic in me thinks that all that will happen is that Local Authorities are simply quietly removed from BC(A)R – problem solved? Interesting article however with respect to “Complete contractor controlled self certification” – calling such a procedure “contractor controlled” self certification can only be described as such if the principal or one of the principals of the contracting firm is signing the Design Certificate and the Completion Certificate. Likewise for these private certification companies that have sprung up – Certification “by the company” can only be described as such if only the principal of the certification company signs the certificates. If such certificates are being signed by employees of such companies then it cannot be described as “contractor controlled” or company liable self certification. It can only be described as construction controlled by a contractor and certified by an individual – an employee – reachable by prosecutors (unless they emigrate) long after their employer may have wound up or gone out of business. The role of the Architect pre-BC(A)R was based on the premise of controlling the builder to ensure quality of work. The architect acted fairly between the parties to the building contract with the aim of ensuring a compliant building was delivered for a reasonable price. This role became blurred over the years and builders became developers and consequently clients. The architect often found themselves ploughing a lonely furrow based on the applicable standards of the day with clients whose goal was maximizing profits. Many builder developers took a responsible attitude and even those who put their architects through hoops were only seeking the point of minimal compliance without crossing into non-compliance. But some, as we have seen in recent months, strayed far across the line into the territory of criminal non-compliance. This occurred under the old regulations I hear you say. Correct. But the new regulations do not address this in any meaningful way and actually prevent redress to the contractor over the quality of the built work so long as he can show compliance with issued documents. Why do I say this is a derogation from the previous requirement. I have never seen a set of documents which correctly addressed every issue in full. Many specifications are performance based as opposed to delivering working details. Many details themselves are issued as typical details, not specific details. Even specific details, where issued, tend to be changed for client requirements on site or through new regulations or best practice being invoked. A building site can be a moving feast where compliance is concerned. Thus to focus compliance on documentation issued at Tender State of even at IFC (Issued for Construction Stage) is a red herring, a means of placating a public which deserves far better than it has got from the Irish Building Industry over the past ten years. The ONLY way that compliance can be delivered is to make the Contractor liable for the built work. This includes the final, built design of the building. This cannot rest on the shoulders of the Design Certifier and his documents, or the Assign Certifier and his limited inspections. The guarantee of compliance MUST come from the company that controlled the production of the building. The sooner our politicians stop pandering to the forms that donate to their political campaigns and work on behalf of ALL their electorate, the better. 1. The acceptance of additional costs for compliance with the ever-more-rigorous Building Regulations including the relentless increase in building specification and high level of workmanship during construction associated with pseudo-Passivehaus levels of insulation. 4. The acceptance of the game played by property owners and developers, of bottlenecking supply to increase demand and therefore prices. The bottom line is that Item 1 is a given – the savings in heating costs and therefore reductions in carbon production using passive or active methods can only be achieved by increased investment (higher costs) in terms of the quality of design, skilled manpower, additional sealing, additional insulation, additional technology and additional monitoring and control systems. Items 2-3 are subject to Government Policy and the Government has shown it will buckle both for the electorate AND wealthy sponsors of Government parties. What it will NOT do is act to curb the profits made by its corporate sponsors. All of our greedy little empire builders are now lining only waiting for prices to rise to whatever self-determined level they are happy with before releasing these over-priced matchstick hovels into the market. No fear that the Government will do anything to prevent them taking advantage of this false market like before – no sign of the government building social housing. The Market will provide? Nonsense. The Market looks after itself. Suggesting that The Market will provide is expecting the most incompetent of contractors working for the most corrupt of developers, for the basest of motives (profit) to act for the Public Good. That’s not going to happen, is it?